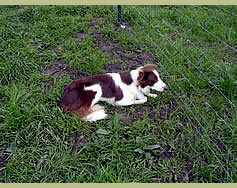 Snook: A red border collie, she came to be from Border Collie Rescue. I actually started herding because of her. I wanted to find something to do with my dog that would help her gain confidence and continue developing a strong relationship with her. Herding was a great way to accomplish both of these goals. Snook has turned out to be a wonderful dog, with the ability to help get the chores done around the farm and also participate in shepherding trails. 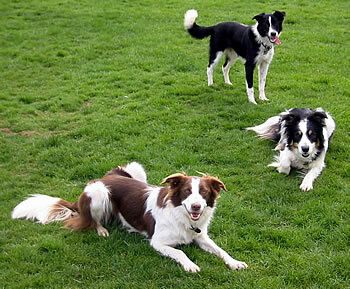 Porsche: A black and white border collie, she came from the Oregon Humane Society as one very frightened, insecure dog. Living homeless as a youngster, she learned that people were not to be trusted! 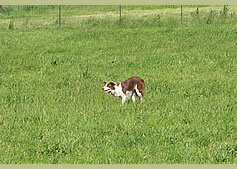 Porsche has been a journey.....and herding has definitely been the one activity that has turned this rescue into a dog. Loaded with tons of natural talent, but hindered by the fear and desire to flee, she is now working sheep in the big field with consistency and confidence. Spark: A tri-colored border collie...we are sure he really is a golden retriever trapped in a border collie body. He has never met a person he doesn't like! He actually belongs to my son, and is an agility dog extraordinaire! He has gone to NADAC agility championships two years in a row working with his junior handler. His herding career has yet to begin!